The cloud is not only for business entities, schools can also benefit from utilizing cloud products to improve their networks, enhance security, and increase agility. Furthermore, it can also dramatically improve communication and the sharing of data within school communities. It’s a move that can help save money as you don’t have to invest in physical hardware like on-site servers (which come with added cooling costs) and there won’t be any need to hire in-house IT professionals to maintain it. What’s more, cloud computing also provides a unique opportunity to scale up or down depending on current needs. As software updates and security patches are managed off-site, staff resources can be spent elsewhere. Furthermore, schools can also benefit from not bearing the expense of 24/7 monitoring of the data-center off-site. 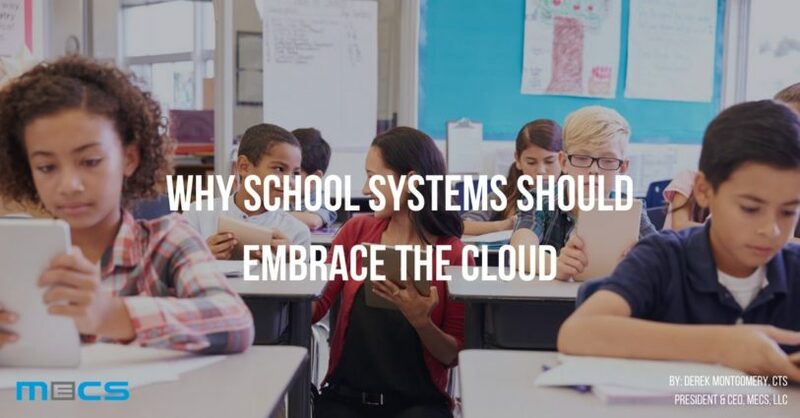 Let’s take an in-depth look at why it’s important for schools to move to the cloud. More control doesn’t mean more security. According to the technology research and advisory firm Gartner, public cloud infrastructure as a service (IaaS) workloads will experience at least 60% fewer security incidents than those in a traditional data center environment by 2020. Gartner concluded that security of major cloud providers was as good as or better than most enterprise data centers. However, when moving in-house workloads to the cloud, it’s always best for security teams to leverage programmatic infrastructure and automate as much as possible to reduce the potential for human error (which is often the primary cause of security breaches). As ransomware attacks become the norm, it’s critical for schools to ensure that they are adequately protected. When schools use cloud platforms, the school community can benefit from enhanced agility. Clouds empower teachers, students, and parents with continuous access from anywhere. This approach also provides an opportunity for teachers to post important messages that can be easily accessed by parents and students. Furthermore, it will also be much easier to maintain an archive of completed work that can be accessed seamlessly by parents and students. As all the data will be stored away from the school premises, continuous access can be maintained in the event of natural disasters. Furthermore, cloud service providers have hardware and security professionals that are a league above what a school district can afford, so it’s an added benefit that comes at no extra cost. This approach will also help minimize any downtime due to hardware failures. Another major advantage of switching to a cloud-based environment is the fact that it can bring together data pools that were previously disconnected. Furthermore, school administrators and educators will be able to access everything they need in one central location without the need to purchase extra hardware. While schools might be slow to embrace the cloud due to budgetary constraints and concerns regarding compliance, a closer look proves that this approach is actually cheaper and more secure. As a result, you can expect schools on the cloud to become the norm within the next couple of years. MECS offers custom academic consultations to help you understand your organization’s IT needs.